March 27th, 2018 by Chloe L.
When it comes to the muscle car segment, there are only four models. However, many people will argue that the Dodge Charger isn’t a “pure bred” muscle car because it has four doors rather than two doors, so depending on who you are talking to, there may only be three muscle cars available, the Dodge Challenger, Ford Mustang and Chevy Camaro. But in all honesty, it’s a little hard to compare the Camaro or Mustang to the Dodge Challenger. 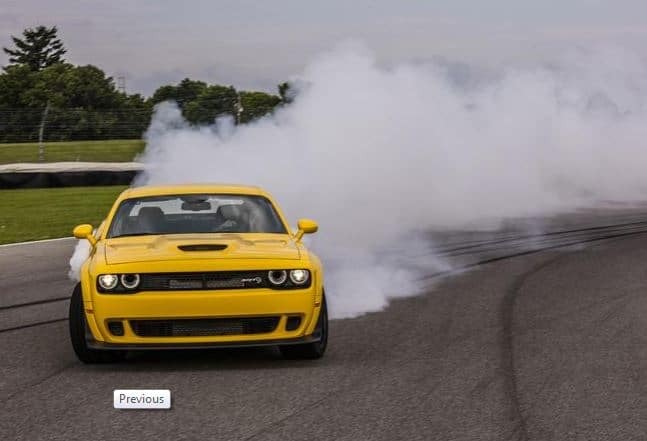 Since the introduction of the 707-horsepower SRT Hellcat model to the 2015 model year, Dodge has focused on making the Dodge Challenger “THE” muscle car for all drivers, and their all of their hard work has nearly put the Challenger into its own class. Unlike the Ford Mustang and Chevy Camaro, which only provide seating for four passengers. the Dodge Challenger provides seating for five passengers, and five passenger seating is a big benefit for a lot of drivers. The 2018 Challenger lineup includes 16 trims! That means the Dodge Challenger is available in a number of price points and with a ton of options. The Ford Mustang is available in nine trims, three of which are only different from other trims because they have a convertible top, so its really like six trims. The Chevy Camaro is also available in six trims (all Camaro trims are available with a hardtop or a convertible top). Dodge also diversified the Challenger lineup by adding an all-wheel-drive option, which makes the Challenger the only two-door muscle car that is a practical option for people that live in places that experience ice or snow. The Dodge Challenger is available with five different engines, and three of those are performance engines, including the most powerful factory produced engine ever. The Chevy Camaro is available with four engines, two of which are performance engines, and the Ford Mustang is available with three engines, two of which are performance engines and when comparing all of the performance engine options, the Camaro and Mustang don’t stand a chance.. The Dodge Challenger’s performance engines produce either 485 horsepower, 707 horsepower or 840 horsepower, and that’s significantly more than the power produced by the two Ford Mustang engines, a 460-horsepower engine or a 526-horsepower engine, and the two Chevy Camaro engines, which max out at 455 horsepower or 650 horsepower. Dodge is the only muscle car available that has made modernized some of the original muscle car features and made them available today. The Dodge Challenger is available with a shaker hood, which is both a performance feature and a heritage-inspired feature. The Challenger is also available with High-Intensity Paint (HIP) colors, which go all the way back to the early ‘70s. Want to check out a Dodge Challenger for yourself? Come by University Dodge, we are located on S. University Dr. in Davie and we are open seven days a week. You can also view our Dodge Challenger inventory online.